At the end of last year, PMF spoke to John Bennett, Managing Director of Bennetts Car Parts, about how the third-generation family business is getting on in a tough and competitive industry. Q. Could you provide a little background to Bennetts? How did it come about? John Bennett: Bennetts is – and always has been – a family run business, it was started by my father, David Bennett, in partnership with my grandfather, Leonard Bennett, in St. Albans, Hertfordshire, in 1954. The company is now run by my brother Mark and me, so the business is now in its third generation of the Bennett’s family. Q. How many branches now operate under the Bennetts name? JB: Currently 27 Bennetts branches are in operation across the country, plus our own Diesel Diagnostics Workshop, where our fleet of vans are serviced and repaired. Apart from Bennetts branches, we have recently formed a new venture; our sister company is called Independent Motor Factors, of which we have opened five branches in 2018. Mark and I have joined forces with the former owner of Car Parts & Accessories (CPA) and also Jayar Car Parts. These five branches are located in the Surrey and Sussex areas. Q. What are the challenges of managing more than one branch? JB: Logistically, it can be a little bit of a nightmare at times, with depots spread from Essex to Suffolk to Shropshire, but with our trained and competent staff it makes life a lot easier. When all the cogs are rotating in the same direction, the business continues to flourish. As you can imagine, with over 200 staff and a fleet of over 100 vans, you need the right senior management in place to cope with the demands of 27 branch managers and their internal staff issues when they arise. Q. What role does retail play in the Bennetts business? JB: Retail plays a very important role in the company. We are very competitive with our retail pricing compared to others in the marketplace. We regularly check that our shops are not overpriced because we want our retail customers to have trust that they are not being, for lack of a better term, ‘ripped off’, especially with so many competitors out there. We have a vast range of tools and accessories at our disposal for amateur mechanics, any tool we do not have on the shelf can be ordered for the next day from Draper, Sealey, Laser Tools, SIP, Sykes, Britool and many more. 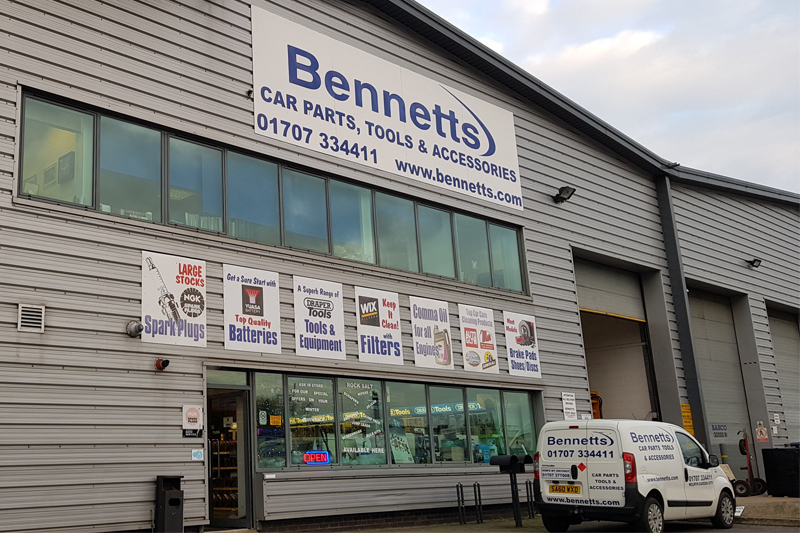 The more retail customers we have through our doors the better – they can spread the word to friends and relatives to buy their car parts from Bennetts. Our friendly and informative staff are there to help at all times, whether it’s for a headlight bulb, antifreeze, wiper blades, wheel trims, vehicle towing accessories, hi-vis jackets or European travel kits. Q. How was 2018 for you? JB: 2018 has been a very good year for Bennetts; our year-on-year sales have increased, we maintained a fast delivery service, and also vastly increased our stock holding – so we are definitely doing something right! We added to the Bennetts brand by opening two new branches this year at Royston in Hertfordshire and Billericay in Essex. This created jobs in those areas, which meant promoting staff within the company and recruiting new members of staff through advertising and word of mouth. We are always looking out for experienced staff with a motor factor background, especially managers and assistant managers. Q. What is the most pressing issue facing the factoring business at the moment and what are you doing to combat it? JB: Stock replenishment seems to be an issue for some suppliers recently. Parts are either on backorder or just simply out of stock. With this in mind, we have had to second source from other suppliers that have contracts and are approved by The Independent Motor Trade Factors Associated Limited (IFA), the buying group we are affiliated to. There are multiple suppliers we can use throughout the country, so this problem can be fixed temporarily until our usual sources have their stock back in place. Q. Are there any big plans for the year ahead? JB: Yes, most definitely – expansion is at the top of our ‘to do’ list! There will be more Bennetts branches coming in 2019 and future years, as well as more IMF branches.